Named after the William Blake poem The Tyger – yes there was a tiger in this episode – “In the Forest of the Night” is the 10th episode of Season 8 Doctor Who; as well as the last episode before the two-part finale. That’s right, the finale is already upon us. So what did this episode start to set up for us? Well to be quiet honest, this episode wasn’t really anything new. With there being no real danger, a lot of grandiose theories that went nowhere and another 5 second cameo by the mysterious Missy, this episode represents the weakest of this Season thus far. Though more than that, this episode sets a worrisome tone for the two-part finale and how ‘wibbley wobbley timey wimey’ it may be. This might have been Frank Cottrell Boyce’s first foray into writing an episode of Doctor Who; but everything about this episode seemed very familiar – both this season and past ones. For starters, the whole idea of trees just being trees (ie: no communication, moving parts, etc) was kind of already dealt with a bit in “The Doctor, The Widow and the Wardrobe”. Additionally in that episode, there were a bunch of children. Now there’s nothing wrong with having a child or two in an episode here or there; but this season has had quite a few already. So why is that bad? The overabundance of children in an episode represent the lack of make or break situations. People usually die in an episode of Doctor Who; but the odds of a BBC family show killing off a child is slim to none. It’s why during “Kill the Moon”, we knew that no matter what happened, Courtney Woods would survive. So when you have an episode made up of 80% children, the odds of someone dying or being put in a dangerous situation falls dramatically. This was clearly seen in this episode’s resolution where basically the only thing that had to be done, was to NOT do anything. Having an episode where everything just works itself out in the end is nice; but that exact formula has been used for a third of this season already. “Listen” and “Kill the Moon” – both great episodes – have both already used the formula of ‘it looks like this thing is trying to kill us so we must stop it; but oh wait, it was never a threat to us at all’. Once again, we have an episode where the end result is based on no one doing anything. Though unlike “Listen” and “Kill the Moon”, “The Forest of the Night” had no driving emotional aspect. “Listen” was suspenseful and spoke to a fear deep inside all of us, while “Kill the Moon” gave us the first woman centric episode in addition to some powerful acting from Jenna Coleman. In the end, “In the Forest of the Night” just seemed forced and preachy. Usually a good Doctor Who episode has a life lesson to take away with us. Something eloquently subtle that stays with us and teaches us something about life. Sadly, this episode the subtlety out the window and tried beating over the head with a lesson. Whether it was intended or not, this episode serves as a HUGE poster child for “save the trees”. If this was just a passing light allusion, it would have been beautiful hidden value and shed light on the Gaia principle that feels the Earth as a whole is a living thing. Though instead of that, we heard numerous times how ‘we have to save the trees’ or how ‘humans always kill what tries to help them’, etc etc etc until it all just seemed preachy. Though it wasn’t just the constant ‘save the trees’ idea thrown in our face; but also the closing image that mankinds ability to forget is their superpower. We remember fear; but forget the real causes. This is the reason that we fight wars; but also the reason why we have kids. Again, this is a great moral and take away about the double-edged nature of being able to forget; but the execution is just horrendous. This whole aside was brought in because the Doctor knows that people will forget this all happened; but if something as tremendous as an overnight forest happened in this day and age we’d never forget it thanks to social media. The finale ‘lesson’ of this episode was uttered by Danny Pink when he told Clara that she must “fear less and trust more”. Again, this is a beautiful sentiment and would be a wonderful new idea, IF we hadn’t just learned it a few episodes ago in “Kill The Moon”. The whole theme of “Kill the Moon” was to trust that things will work out and that not everything wants to kill and destroy. So hearing Danny utter these words here and spark some revelation in Clara just seems incredibly pointless. It’s almost as if she forgot everything that happened already. All in all, this episode could have been the poster child for Moffat Era Doctor Who episodes that try to be clever for clever purposes only. As if this episode wasn’t overly done as it is, it was also really hard to follow verbally. Between the background score and the exceptionally hurried pace of speaking – ironic considering nothing really dire happened – it was incredibly difficult to understand most of what the Doctor or most of the children were saying. I found myself having to rewind several times before I got the gist of what they were saying. In one or two instances, I even needed closed captioning on. I love the new Doctor’s accent as well as the music sometimes; but you have to balance and pace both. This episode sadly did neither. Though despite all the subpar and over the top aspects of this episode, there were some clever tie ins. For starters, the Doctor’s decision to stick around juxtaposes his decision in “Kill The Moon” to leave and let Earth take its course. 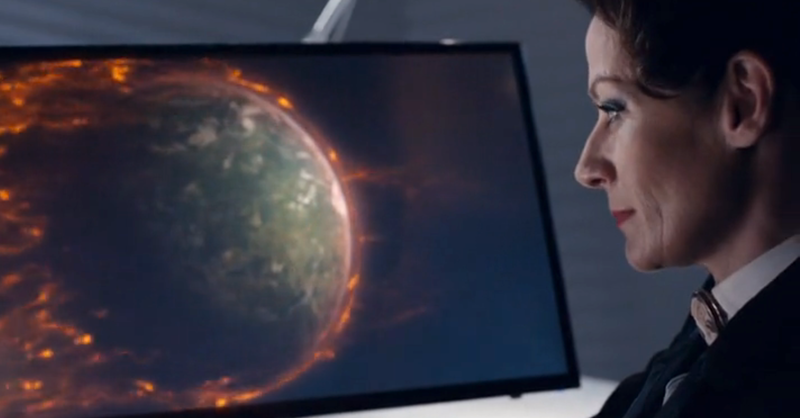 In fact, he even mirrors Clara’s language in that episode about ‘breathing the same air’, etc and calls this his home. Though again, beyond this the episode path was a clear and less threatening rip off of “Kill the Moon”, just substitute giant egg for sheltering trees and nuclear weapons for poisons. Though if the trees could ‘manipulate oxygen to negate flames’ I severely doubt a little poison would have solved anything. Another interesting point was the stark contrast this episode gave us between Danny and Clara. Whereas Clara always wants to fly off on an adventure, Danny puts others before him and just wants to focus on what’s in front of him. There’s no way to really reconcile these two viewpoints. Either Clara looks selfish or Danny looks boring. Though what this also does is start to provide a means by which Clara can leave the series. As I mentioned earlier with the “fear less and trust more” comment, this lesson isn’t exactly new and could have been presented better – rather than just copied, pasted and squished in where it didn’t seem to have much pull. The final interesting tie in for this episode was the Bank of Karabraxos. There we saw how a Solar Storm whipped out and entire planet and the same thing is about to happen hear on Earth. The difference here of course being that there were trees to save the planet. Did Karabraxos die because there were no trees left? At least that’s the way it seems. At the start of the episode when the Doctor mentions how his Tardis’s “terrestrial navigation” always turns off the rest of the systems and how he doesn’t have anyone to teach him. This could be setting up for someone who eventually ‘does teach him’; but more than that it calls to mind the events of The Day of the Doctor and the Time of the Doctor, which show that the Doctor is no longer “the last of his species”. Does he not remember that all this happened? Is part of his memory still blocked? Additionally, Missy and her iPad returned; but this time they gave a very different sentiment than last. Last time it looked like she was glad Clara and the Doctor saved the day; but this week she seemed sarcastically annoyed. When she saw that the trees protected the Earth from the Solar Storm, she seemed rather sarcastic about her ‘love’ of surprises. Contrary to last episode, this ending made it seem almost as though she set the whole Solar Storm thing up. All in all, this was the episode we’ve been waiting for. The episode we knew was coming. The episode that would make things boring, overly confusing, and ultimately feel like a waste of time. Now with the preview of next week’s episode, it looks like the action will return; but more than ever I am afraid of more needlessly confusing moments that serve no purpose. The trailer seems to say that Clara was all some construction by Missy – which can’t be true considering all the stuff we’ve seen of her past, present and future – and birth. I’m hoping the next two episodes can erase the brief stain of this episode; and not make this spectacular season do a nose dive for the last three episodes. Oh well, at least we can remember all the good of this season; and forget the rest – after all, that is apparently our superpower . . .
Now here is one episode that I agree with you on wholeheartedly. Such a waste of forty minutes (since I watched an hour late and could fast forward). I feel like you do, that there is just as much potential for this finale to be great as there is for it to be convoluted. I’m also tired of the, admittedly small, lapses in continuity (i.e. the Doctor seemingly not remembering that the other Time Lords are alive), and I hope that the finale doesn’t compound these by trying to retcon Clara and butchering her character. Also, while I think Capaldi has done well as the Doctor, this incarnation of the titular Time Lord just isn’t doing it for me as much as I’d hoped. Hopefully the finale will bring back the action, as you said, and create a new momentum for future episodes. While I appreciate intellectual and emotionally driven stories, I miss the running and the occasional swashbuckling and unadulterated heroism. I actually can’t wait for it to start. Even if her identity turns out to be dumb, I really do want to know who or what Missy is.